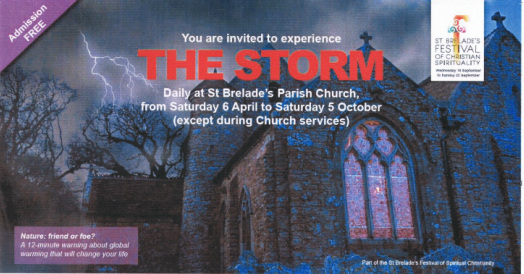 Every day (except during Church Services) a Light Display called 'The Storm' will be projected onto the ceiling in the North Aisle of the Church. The Storm explores humanity's changing relationship with our increasingly fragile planet, inspired by the power and fearsome beauty of nature and the challenges that global warming poses. Rev Mark Bond says: "The book of Genesis tells us that God put man into the Garden of Eden to work the ground and to take care of it - to care for it responsibly under God's sovereignty. Unless we find ways to mitigate, if not halt, the impact of global warming we shall have failed in this duty of stewardship".